“Your dog has osteosarcoma” is the most chilling phrase the owner of a large-breed dog will ever hear. If one is to believe the statistics published in major medical venues and what most veterinarians tell their clients, one might conclude that all dogs diagnosed with osteosarcoma will be dead in less than a year, regardless of treatment chosen. This is simply not true; the stories of the eight dogs that follow dispel this myth. The reality is that the odds of surviving osteosarcoma and dying of old age improve greatly if the lungs are kept cancer-free and certain therapies are initiated. Battling osteosarcoma requires psychological and physical fortitude, finances, time, nursing skills, and a positive attitude; it is not for everyone. Thanks to Carol Weinhold and her Greyhound, Sophie, who inspired this piece and whose story is told in depth, and to seven other owners and their dogs who reveal their fears, joys, triumphs, and eye-opening experiences. Note that some events and methods repeat throughout this piece. Perhaps they will become gold standards for raising the osteosarcoma survival odds in the near future. On Friday evening, May 22, 1999, 8-year-old Sophie broke her left front leg in the yard while chasing a squirrel. Steve and I rushed her to Emergency Veterinary Hospital in Bridgeton, Missouri. X-rays showed a break of the left carpus (distal radial and ulnar fracture). The leg was stabilized with a cast wrap; it couldn’t be set because of a “moth eaten” area seen on the x-ray. Clearly, it was bone cancer. Her only option was amputation. I will never forget the vet telling us, “Dogs are born with three legs and a spare.” Shocking as it was to hear, I have never forgotten that statement or how true it really is. The ER vet gave torbugesic for pain and instructed us to keep her inactive and to carry her until we were able to treat. Our veterinarian, Dr. James Connoyer, would see Sophie first thing Monday morning. I spent the weekend researching osteosarcoma. 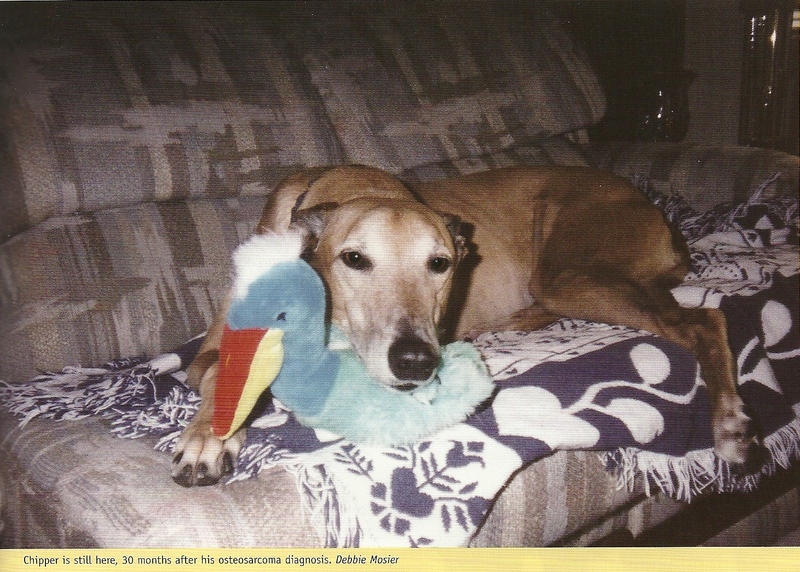 We had only heard of one other dog, a greyhound, in the St. Louis area with osteosarcoma. I called his owner. On Monday morning, Dr. Connoyer agreed with the ER veterinarian’s assessment. Chest x-rays showed cancer-free lungs; that was a good sign. He referred us to a specialty veterinary practice in St. Louis and arranged an appointment for that afternoon at 2:00 p.m. Dr. Michael Slawienski, a surgeon with Associated Veterinary Specialists, examined Sophie and was impressed with her sweet, cooperative personality. He said our only options were amputation or euthanasia and explained that amputation without chemotherapy would relieve pain from the broken leg and the cancer but would not extend her life expectancy. By doing both, we could optimistically hope for a 12-month survival. Since Sophie had just turned eight and was in excellent health, we decided to give her every opportunity to battle the cancer and return to a good quality of life. Sophie’s left front leg was amputated at the shoulder the next morning. She had no immediate complications from the surgery. While she was hospitalized, we were “handicap-proofing” the house and the steps on our back deck. Two days later, Sophie came home. We were instructed to bring a clean T-shirt to put on her to cover the incision and to provide us with a “handle” to help her balance herself. When the tech brought her to us in the examining room she took one look at us and headed the other direction. This wasn’t the reaction we were expecting! Did she blame us for what had happened? Or, was she getting so much attention and spoiling that she preferred her treatment at the hospital? We choose to believe it was the latter. We were given a lengthy list of post-op instructions, supplies, pain meds, and antibiotics. We needed to keep the wound clean, prevent licking, and limit her activity until her sutures came out 10 to 14 days later. The days immediately following her return home were difficult. She ate well and gained her balance quickly, but she was restless, fretful, and seemed depressed. Someone stayed with her 24 hours a day and lay on the floor with her at night. We didn’t use the prescribed e-collar or a muzzle but kept a clean T-shirt on her at all times. Wrong! We woke at night to the sound of slurping. Two days after finishing her antibiotics (cephalexin 500 mg. three times a day for five days) and only nine days after her surgery, she woke one morning with a nasty infection at the incision site; it seemed to appear overnight! Her surgeon immediately cultured the discharge and ordered more cephalexin until the culture results came back. We cleaned her incision with hydrogen peroxide, applied warm compresses, and reapplied bandages and vet wrap around her torso twice a day. Four days later her culture had come back showing a heavy growth of both staphylocci and enterococci. She started the antibiotic Cipro for two weeks. On June 10, the bone biopsy results confirmed osteosarcoma. We continued fighting infection, yet her wound wasn’t closing. On June 24, the surgeon cleaned up Sophie’s wound and put in a drain. She continued taking Cipro. After another culture came back positive, the surgeon stopped the Cipro and started choramphenicol (800 mg). This drug was no longer manufactured commercially and needed to be compounded after the pharmacist located the ingredients. When we expressed our concerns about all the problems to Dr. Slawienski he told us something that would prove insightful. He said that animals with cancer who experience infections often have a better than normal survival rate. On June 30, Dr. Slawienski removed the drain. He was pleased with the incision but we needed more bandages. This time Dr. Slawienski made a point to send us home with both red and blue vet wrap. He said with the 4th of July coming up we should be “creative” with Sophie’s bandaging. When we put fresh bandages on Sophie we gave them a patriotic flair. We cut the red vet wrap in narrow strips and spaced them about an inch apart over the white cast wrap. We used blue vet wrap on the upper half of her body and made white “stars” out of adhesive tape. Her red, white, and blue visor completed the outfit. We took photos. On July 9, Dr. Slawienski declared Sophie ready to begin her chemotherapy. Her lungs still appeared clear and Sophie was perky, peppy, and acting perfectly normal again. The 11th was her first appointment with her internist, Dr. Liesl Bigge. Dr. Bigge was also pleased with Sophie’s condition and gave her the first of three scheduled carboplatin chemotherapy, each treatment consisting of a 15 minute IV injection. We chose carboplatin because of easy administration and low side effects. Although more expensive than cisplatin, the usual drug of choice, its advantages were worth the additional cost. Sophie experienced no side effects. We started feeding Hill’s n/d cancer diet. We supplemented with vitamins C, E, and omega-3 fatty acids. On Sept 9, Dr. Bigge recommended three additional carboplatin treatments. We consulted with Dr. Carolyn Henry, a veterinary oncologist with the University of Missouri in Columbia. Dr. Henry said she knew of no studies with carboplatin that had shown better results with additional doses and that most universities use cisplatin because of cost issues. She said the decision was ours but if the extra treatments didn’t help, they probably wouldn’t hurt either. On Dec. 21, the sixth and last carboplatin treatment was administered. Over two years, Sophie continued to see Dr. Bigge faithfully every three months for chest x-rays and rechecks. Our prayers were answered; Sophie remained well. Two years post diagnosis we continued to be amazed at her good health. Dr. Bigge thumbed through Sophie’s thick file and referred to her post-op infections. She reiterated what the surgeon had initially said – that although there had been no studies on the subject, most oncologists had found that dogs who had infections in conjunction with osteosarcoma tended to have an approximate three year survival rate. Forty-one months after her initial diagnosis a baseball-sized tumor appeared on her right scapula. Dr. Bigge recommended palliative radiation for pain management even though Sophie didn’t appear to be in pain from the tumor. Sophie returned to Dr. Carolyn Henry. Dr. Henry ordered numerous tests, including bone and CT scans, to reevaluate her cancer. Samarium isotope was considered because once implanted it would not require repeat treatments as radiation would. Results of the bone scan revealed a second metastasis on a lumbar vertebrae and a fracture. Because of soft tissue involvement at the scapula Sophie would not be a good candidate for Samarium. Therefore Dr. Jimmie Lattimer, head of radiology, “mapped” her for radiation treatment only. The vertebrae area proved problematic, but Dr. Lattimer was able to successfully map both tumors. When Sophie received her third radiation treatment she had her first pamidronate treatment in hopes of helping stabilize the fractured vertebrae. When Sophie received her fourth and final radiation treatment, lab results showed protein in her urine. We discontinued the pamidronate to preserve her kidneys. Instead, Sophie began taking oral Fosamax. With late stage cancer the goal was to keep Sophie comfortable, stable, and pain free. The radiation shrunk the apparently painless tumor. The location of the tumor was a positive, not being in a weight-bearing area. In January 2003 blood work showed kidney problems. We changed her diet from n/d to k/d. Her condition declined slowly over the next few weeks. Her good days outnumbered her bad, but that gradually began to change. She became more restless, requiring pain meds at night. She lost interest in food and became less active. 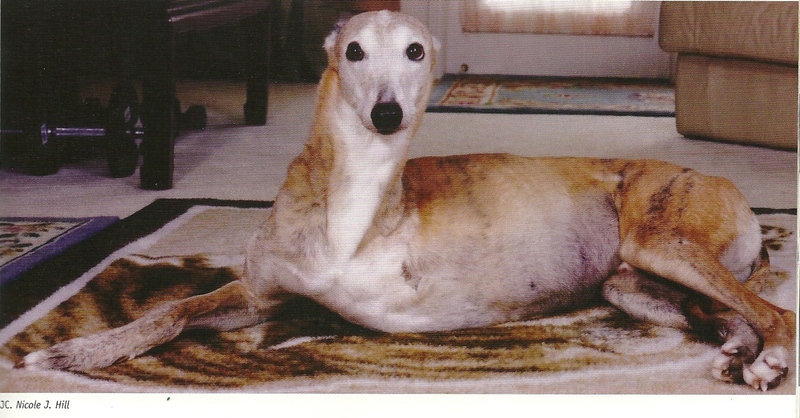 We adopted Chipper in February 1998 after years of wanting a greyhound. 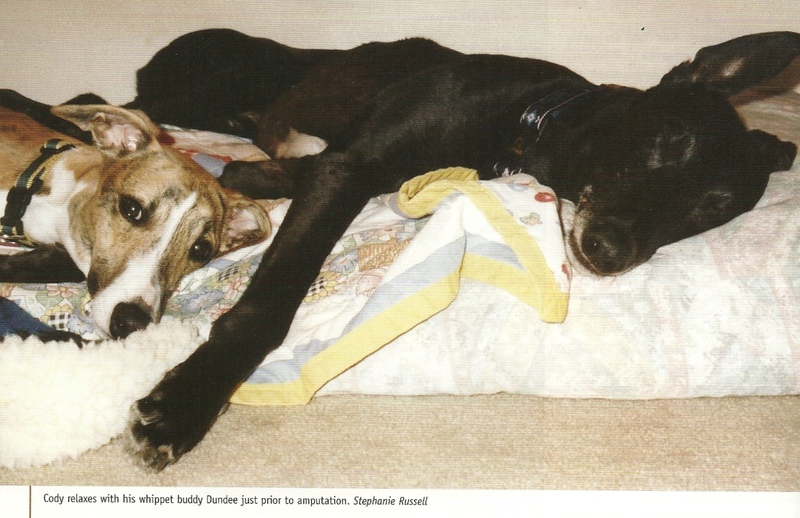 He was and still is the perfect greyhound, except now he only has three legs. In July 2001 my son asked if we could teach him to shake the other paw instead of the usual front left leg he always gave us. When Chipper gave me his left front leg I realized that there was a bump on his wrist that I hadn’t seen before. Chipper went to the veterinarian the next day. She referred me to a veterinary specialist and put down “osteosarcoma” as the possible diagnosis. I panicked. Two days later Chipper went to the specialist. In the meantime I did major Internet research to learn about osteosarcoma. I saw x-rays that looked exactly like Chipper’s. I knew he had bone cancer. We went to the specialist, Dr. Allsup of Michigan Veterinary Specialists in Southfield, Michigan, prepared for bad news. We decided that we couldn’t amputate an ex-racer’s leg. Dr Allsup never tried to convince us to amputate; he just presented the facts. He also had a large bulletin board in the room covered with pictures of three-legged dogs, including a couple of greyhounds. We left there saddened. The veterinarian told us that osteosarcoma is a very painful disease and there is no cure, not even with amputation. The amputation takes away the pain, but eventually it metastasizes in another body part. JC was a robust nine years old and we expected he would have many happy days in our new house. The yard was unfenced at first, so we erected a small temporary enclosure. On one of his mini-sprints around the yard, JC suddenly pulled up with a little “yip” and limped into the house. He gave no further hint of distress, so we decided not to take him to the vet. A few weeks went by. The pain seemed to be gone, but because we were concerned about swelling on his wrist that had not gone away, we took him in. When the vet returned with JC’s radiograph, she bore a serious frown that didn’t fit our suspicions of a sprained wrist. An enlarged area of bone was cracked. She pointed out its features and somewhere in her explanation we heard the word “osteosarcoma.” Her diagnosis was unequivocal. We were devastated. We had lost two dogs in two years and now it appeared we were going to lose another. She referred us to a local veterinary specialty hospital. A few weeks after diagnosis his left front leg was amputated. The next day he was lying, swathed in bandages, on the cold hard hospital floor. He was sedated and hardly seemed to recognize me. I sat there petting him and hoped we had done the right thing. Would it have been better to put him down? He soon had the strength to go outside on lead to relieve himself. On day four we brought him home. By then he had become swollen from his surgery, ballooning to half again his normal size. Moving was extremely uncomfortable for him. The swelling went from under his jaw to between his hind legs. He was bruised and his platelet count was very low. The surgeon who operated on him prescribed doxycyline and sent in a tick titer, suspecting that tick disease could be playing a part. JC had a hard time at home. When we tried to assist him he’d shriek. No assistance with a sling or guiding hands could compel him to go outside, so 24 hours later we took him back to the hospital. The vet on call found a urinary tract infection, and she ordered he be taken outside every four hours and he was given additional antibiotics for that problem. One week after his surgery, we brought him home for good. The antibiotics had kicked in, his swelling was significantly reduced, and he was able to go outside again. His tick titer came back negative, but he was kept on a full course of doxycycline just in case. The complications from surgery and the slow-healing incision delayed his first treatment for a month. He had four treatments with carboplatin every four weeks because his white cell counts were always too low to proceed at the usual three week interval. In the passing weeks JC’s personality started to return. He walked and cantered around the back yard. He resumed his regular station beside us on the couch. 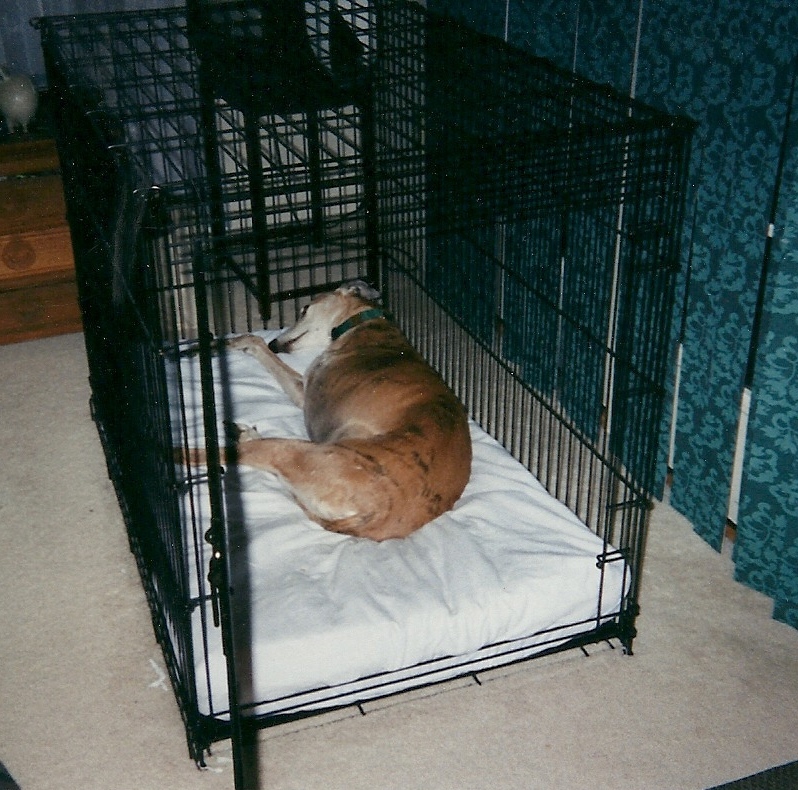 By May of 2001 we had adopted another greyhound and erected a permanent fence that dramatically increased his play area. One day he broke into a full run and sprinted around the yard at a speed that seemed the same as what he could have achieved on four legs. Afraid he would injure himself I called him back to the house. He ran back so fast he couldn’t slow down in time to negotiate the ramp and was headed toward our raised deck at full speed. Realizing he couldn’t stop in time, he leaped over a bed of flowers, over a railing four feet above the ground and made a perfect three-point landing on the deck right in front of me and then hopped into the house as if nothing of importance had happened. Our JC was back. We adopted Josie in 1994. In 1996 when he was four, he became lame in the right front leg. It was osteosarcoma. After much research, we consulted with holistic and traditional veterinarians. Rather than amputating or giving traditional chemotherapy, we decided that mega doses of antioxidants and Pycnogenol would be Josie’s primary treatment along with some traditional medications. His treatment regime included Pycogenol, dispensed in 90 mg doses three times a day. Pycnogenol was fairly new to the United States in 1996 but had been used in Europe since the 17th century. Josie’s daily regimen included vitamins C (1,000 mg) and E (1,000 IU). 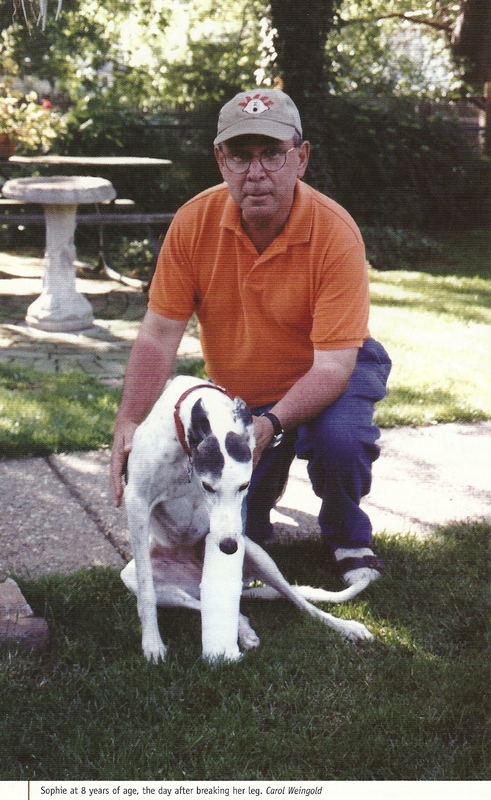 Feldene, a traditional medication, was also partly accountable for slowing the growth of the tumor, according to Dr Harold Reece, DVM, Josie’s Chicago, Illinois surgeon. For pain management we gave 100 mg Rimadyl tablets but only after a CBC was done and only when absolutely necessary. All the veterinarians agreed that this protocol shrunk the tumor and saved Josie’s leg. Josie went into remission by New Years Day, 1997. Encouraged, we sought help from Dr Stan Gorlitsky, a South Carolina holistic veterinarian, who prescribed European, Chinese, and American Indian herbal remedies. He suggested sprinkling one to four tablespoons of Lameze, a blend of nine oriental herbs with licorice, on each meal. There were many meals where Josie actually flipped his dish over as to say, “I’m not eating that!” so we became experts at administering pills, either by coaxing with a tasty treat or literally throwing them down his throat. The hardest thing some days was to get Josie to eat after taking so many supplements, pills, and medicines, but our efforts paid off. The vitamin/supplement doses and the new doctor’s herbal protocol kept Josie cancer free until an unfortunate fracture in his left hind leg (through the lytic area of the tibia) occurred in March 1998. The cancer regenerated faster than the healing process. Josie’s leg was amputated up to mid thigh in late August 1998. Josie took longer than usual to recover from the surgery and took two months to learn to maneuver and adjust to life on three legs. There was much bruising, but the area healed nicely. Caito was a happy, healthy 8 year old when he came in from a play session, favoring his left front leg. I gave him enteric-coated aspirin. Two days later, he was still limping. Caito’s vet, Dr. Jeff Sims, was out, so we saw Dr. Karla Awalt, who had gone to vet school at Colorado State and knew greyhounds. Dr. Karla thought perhaps a toe was bothering him. X-rays comparing the lower parts of his front legs showed something different in the two legs. Just above the joint on his left ulna was a very faint shadow, which may have gone unnoticed without the comparative x-rays of the right leg. Dr. Karla called Auburn and got us into the Small Animal Clinic the following Monday. I talked with Dr. Jeff about options. Removing a leg from a world class athlete was unfathomable to me, but as we talked about pathological fractures and pain control, I decided this was the route we’d go if Auburn confirmed the diagnosis. His lungs were clear and his blood work was fine. At Auburn we met two surgeons, a radiologist, and an oncologist. 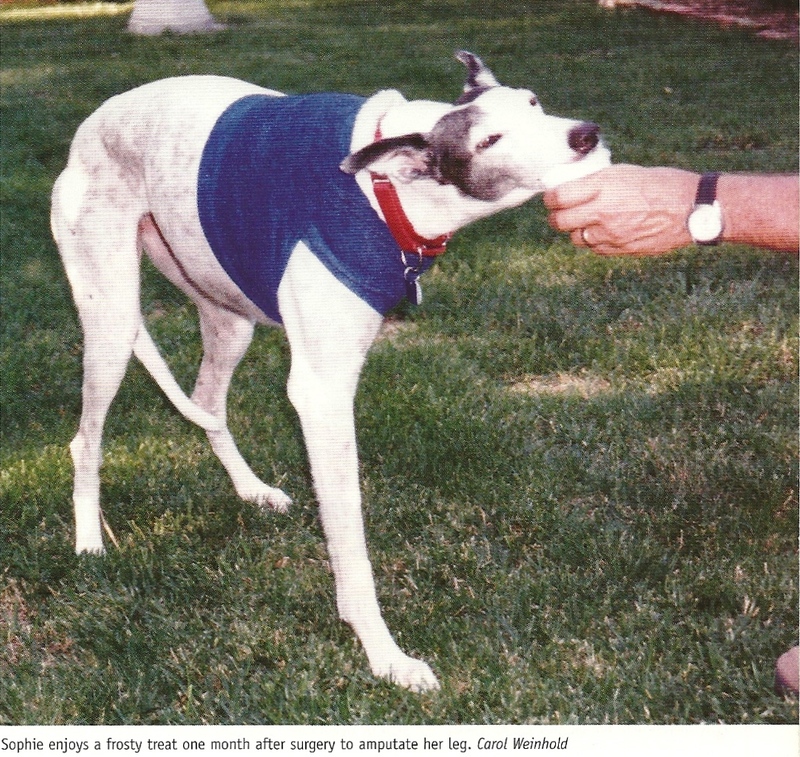 Caito’s leg was amputated on September 21, 1998. His recovery was uneventful. He used a homemade ramp to get in and out of our Explorer. He mastered the steps at home in a few days. In the meantime, I had talked to a number of people with osteo experience and did in-depth research. Once the diagnosis was confirmed an agonizing month later via the pathology report, Dr. Jeff consulted with vet oncologists in Memphis, at Colorado State, and at Purdue. We chose to use Adriamycin, beginning chemotherapy in late October. He received chemo five times every other Friday. As a nurse, I expected the worst, i.e., vomiting, diarrhea, and loss of appetite. Dr. Jeff hydrated him before his treatments as well as ran CBCs two days beforehand, gave him an anti-emetic and sent him home with Reglan afterwards. The only adverse effect was tiredness. After finishing the chemo, Caito seemed to be stiff despite taking glucosamine throughout. 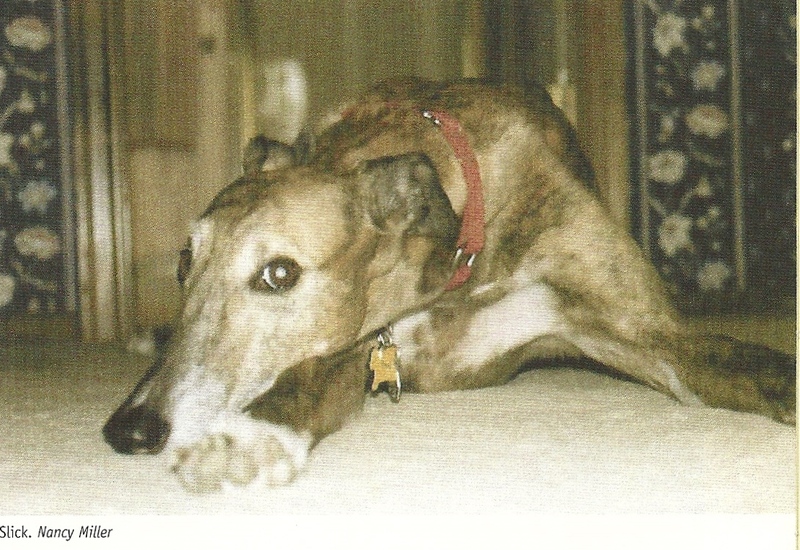 Ady Cerrata, one of my best friends whose greyhound, Sabre, was diagnosed with osteo shortly after Caito, worked with a holistic vet who performed acupuncture at home. He was there one afternoon and she suggested I bring Caito. He did a treatment and Caito was instantaneously better. Dr. Thom came to our house three more times when Caito was having a tough time. 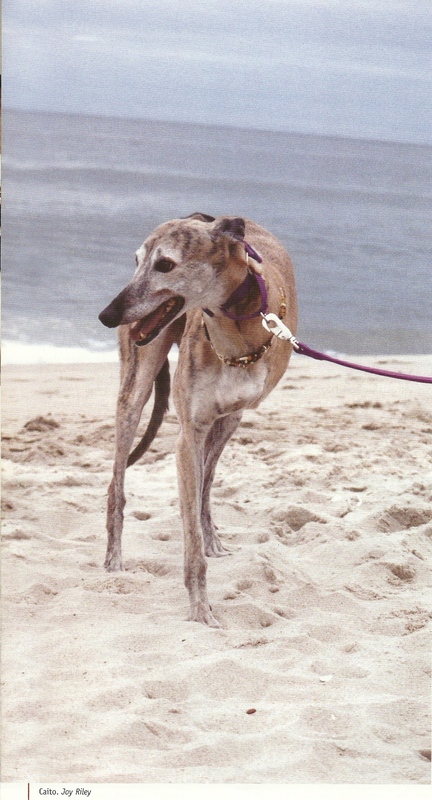 Caito went on to enjoy hosting countless foster greyhounds, doing Meet and Greets, and romping on Dewey Beach the following year. Slick was diagnosed with osteosarcoma in August, 1998 after he broke his leg. There were no physical signs prior to the break, i.e, no limping, favoring, or soreness. Doctor Mary Jean Gorse, DVM, MS, of Veterinary Specialty Services in St. Louis repaired the leg because there were no visible tumors at the time. She said that the screws went in well — the bone was strong — and that made her think that there was no cancer involved. Fortunately, the veterinarians at the practice always do a biopsy for a suspicious break, and that is how we discovered the cancer so early. If not, the scenario could have been very different. His right front leg and shoulder were amputated. He underwent a dual protocol chemotherapy treatment of cisplatin and Adriamycin, having four treatments three weeks apart. The first treatment was delayed because of an infection at the amputation site; they had to reopen part of the wound and cut away some dead tissue several weeks after the amputation. That prolonged healing time and postponed the chemo treatment. He did really well, despite concerns about the delay. Because Slick was the second dog at our clinic to have the dual protocol chemotherapy, they had no stats on longevity for this. They told us he had an 80% chance to be alive after 12 months and a 50% chance to make it to 24 months. Slick’s ordeal was featured in a television news story in St. Louis, Missouri. In July 2000, two years after the diagnosis, they found a tumor in his lungs. We watched it for several months and since it grew very slowly and was the only one, we opted to have it surgically removed. Much to everyone’s surprise it turned out to be a primary lung tumor and not metastasized osteosarcoma. We never expected to buy that much time for him, so we considered ourselves very fortunate. Robin Downing, DVM, and author of Pets Living with Cancer, a Pet Owner’s Resource, writes about her Great Dane, Murphy, who was the inspiration for her cancer book. Murphy was five years old when she was diagnosed with osteogenic sarcoma in her left front leg. She had a limb-spare surgery at Colorado State University, followed by four rounds of chemotherapy with carboplatin. Three years later, Murphy was diagnosed with a second osteosarcoma in her right rear leg. This time she had radiation therapy followed by four more rounds of chemotherapy. Her second remission was still in place when she died two years ago of heart failure in her sleep during a mid-morning nap. She was in remission four-and-a-half years. 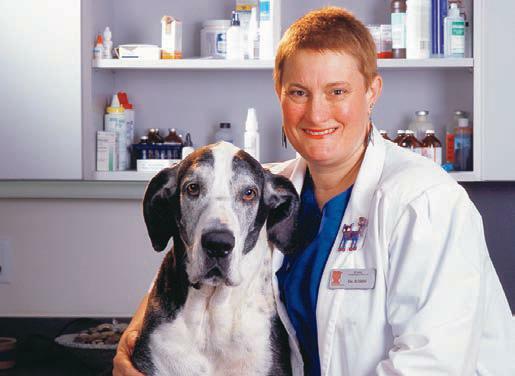 Dr Murphy attributes Murphy’s longevity to the combination of early and aggressive intervention for her cancer, as well as to her eating Hill’s Prescription Diet Canine n/d – still the only scientifically demonstrated nutritional tool for battling cancer in dogs .She said in 2003 that she now rotates between Adriamycin (doxorubicin) and carboplatin when treating bone cancer. There is no evidence that Adriamycin at the currently accepted doses causes cardiomyopathy. At high doses it does. – Robin Downing, DVM. Author’s notes: These eight dogs represent only a small portion of greyhounds (and other breed dogs) with osteosarcoma and, by projection, show only a small portion of treatment successes as well. Osteosarcoma in our dogs terrifies us, and it should, but these stories show that it is not an immediate sentence of death. Please note that many of the dogs had concurrent infections after the amputations. Carol Weinhold, Sophie’s adopter, had thought from the “get go” that her infection had saved Sophie’s life. Now, in 2010, that has proven to be true. Sometimes anecdotal evidence becomes scientific fact and the best anecdotal evidence comes from the people who love their afflicted dogs. May all vets listen to their patients. Please read read Dogs of Hope 2010 for more survivor stories. This artile has lifted my spirits. My beloved Tye is at the vets as we speak after having his leg amputated today. They say three’s the magic number and hope this is true for my 9yr old greyhound. I’m glad the article has given you the hope to proceed. I wish you all the best. Please read Dogs of Hope 2010; it has a few more success stories. I am so inspired by this. I found out yesterday my Maggie(german shepard-great dane mix) has osteosarcoma. Tuesday she will have a biopsy to be sure and to check what stage it is in. We took x-rays of her chest and so far nothing is there, which gives us hope. I was so worried after reading that recovery is usually 6-12 months with amputation and chemo. Or 3-6 with just amputation. This article gives me hope. I also watched some videos of other survivors. I think Maggie will be fine on three legs. She is very stong and slender. She loves to run, it is nice knowing she can still do that. We are praying it doesn’t show up in her lungs(I hear that is usually what takes them in the end)Thank you all for sharing. Prayers all around. What a great article! 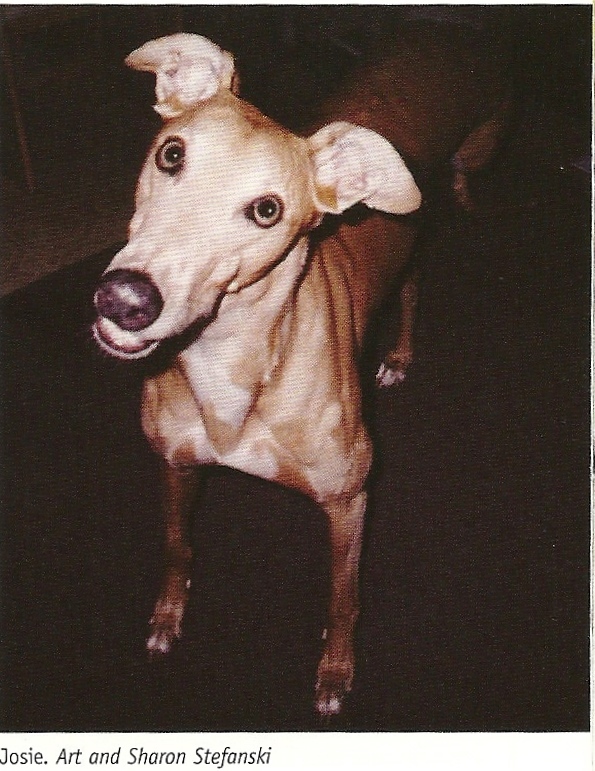 My greyhound JD (M’s Wrong Dog) lived a year with osteosarcoma without amputation, radiation or chemo. We had him on a high protein raw diet and eliminated cancer feeding carbs. We treated the cancer aggressively with Chinese herbs, antioxidants, homeopathy and reiki. The vet did bone building IVs of Pamidronate. We gave the pain killer Gabapentin every day because it also slows the growth of some cancers. It wasn’t the cancer in the leg that got JD in the end. He still put weight on his front leg the day we made his final trip to the vet and had played with toys only a few days before. The cancer moved into his lungs and he began to have difficulty breathing. When he could only walk a few steps without getting out of breath and told us it was time by stopping playing and eating we helped him cross the bridge.